If you are reading this, chances are that you get most of your political information online, on television or on your smartphone. Many myths are floating around these media, and given the echo-chambers and the tribal battlefields that we inhabit, some of the myths are left so unchallenged that they are accepted as truths. Let me debunk some of the most prominent ones. 1. Nobody has a monopoly on nationalism. Just because the BJP’s leaders and supporters throw the term “anti-national” at anyone they disagree with, it does not follow that nationalism is the sole preserve of one party. It may be that other parties don’t proclaim nationalism as their main proposition, but it does not follow that they are any less sensitive to national interest. Also, nationalism and patriotism are two different things — like Rabindranath Tagore, you can be a patriot (a person who loves his country) without being a nationalist (a person who believes in the superiority of the national identity). Moreover, unlike its European counterparts, Indian nationalism has always been liberal, pluralistic and inclusive. Therefore, it would actually be anti-national to exclude fellow Indian nationals on the basis of religion, caste, language or ethnicity. 2. Coalition governments are not a bad thing. For all the bad press coalition governments get, they can do a fairly good job. In fact, the weak coalitions that governed India through the 1990s held firm on economic reforms, nurtured the nuclear weapons programme, weathered international pressure on WTO and Kashmir. Then-Prime Minister Deve Gowda, heading a precarious coalition at a precarious moment in India’s economic history, firmly refused to sign the Comprehensive Nuclear-Test-Ban Treaty (CTBT). Ramakant Khalap, his law minister, modernised the Code of Civil Procedure in a government that hardly lasted a year. It is sometimes painful to see a coalition government debate its policy in the open, indulge in horse-trading and manage egos, but that’s better than being blissfully in the dark. 3. Not all parties are the same. A common refrain in the past used to be “they’re all the same”. Now, it is “other than the BJP they’re all the same”. Well, they are not. I have argued that India’s political parties and politicians differ in their attitudes towards identity and liberty. Some are more deeply committed to one identity while others are not; some believe in private enterprise while others believe in the state having a larger role; some are more okay with individuals asserting their freedoms than others. If you still think “they are all the same”, study them more closely. 4. This election is not only about Modi. As I wrote in my previous column, the BJP is making this a parliamentary election with presidential characteristics. It is entitled to. It does not, however, mean that voters will see it that way. It would be massive conceit to argue that anyone can know how 900 million voters will vote. 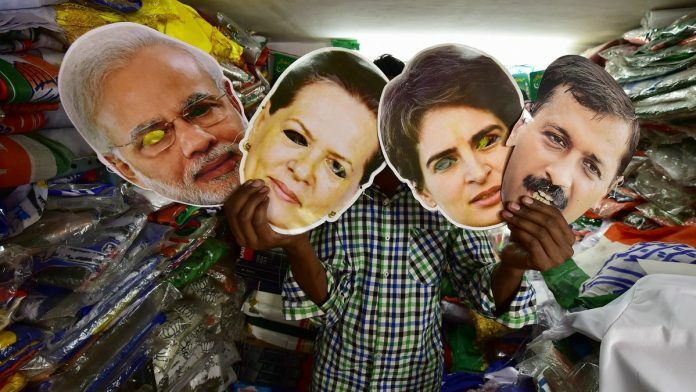 A number of factors — from emotional reasons to practical ones, from national preferences to local considerations, from policy agenda to caste considerations — continue to exist and will play out differently in different constituencies. 5. This election is not about Rahul Gandhi either. In the past few years, the standard response to any criticism of Narendra Modi has been to accuse the person of being a Congress sycophant and a dynasty slave (often, without the slightest irony, by people who call themselves Modi worshippers). The political spectrum is not binary, and voters might support other political parties or independents. Or they might support none. 6. But NOTA is the worst option. Other than register your disappointment, frustration or disgust, voting NOTA serves little purpose. Adults, as opposed to children, get the right to vote because they must confront the real world. The ideal candidate doesn’t exist. We need to choose between the ones available. You could choose the better among the two, or the least worst of the lot, but you must make that choice. That is your responsibility as a citizen and ducking it is thus an abdication. 7. Unlike love and war, all is not fair in elections. People often cite Kautilya, compare modern elections to wars between ancient kings, and argue that all politics is amoral and winning is all that matters. On the contrary, domestic politics is carried out within the boundaries of the Constitution. Acts that violate the Constitution’s letter or spirit are immoral. Those who play by the rules send a “costly signal” indicating that they are more likely to defend the constitutional order. Some things are becoming more clear now. This is not a wave election, which is another way of saying that a presidential format will not define it. The South and East are proving impervious to both combat and seduction. Credible surveys suggest the sugar high from Balakot has ebbed almost completely. So just as the Ram Mandir – which was thought to be a very powerful, emotive issue – has faded away, building the entire campaign around nationalism, security threats, identity is looking like a risky gambit. It may not be what voters wish to hear on more than a hundred occasions. The regional leaders are picking up the heartbeats of voters more effectively. Rahul Gandhi should be sending them flowers and cake. Nitin, I am really glad to see this article. Thank you and keep writing. I hope the sane voices get a little more space in the New India. We do need the propaganda to die a unnatural death (it must not be allowed to run its course, we have been already been fooled once), else we run the risk of destroying lives (we have already lost more lives than necessary) and even the country. A deceitful self-obsessed individual or a group can destroy a nation in no time, we have seen that more than once.